Introduction: Holzinger, A., Goebel, R., Palade, V. & Ferri, M. 2017. Towards Integrative Machine Learning and Knowledge Extraction. 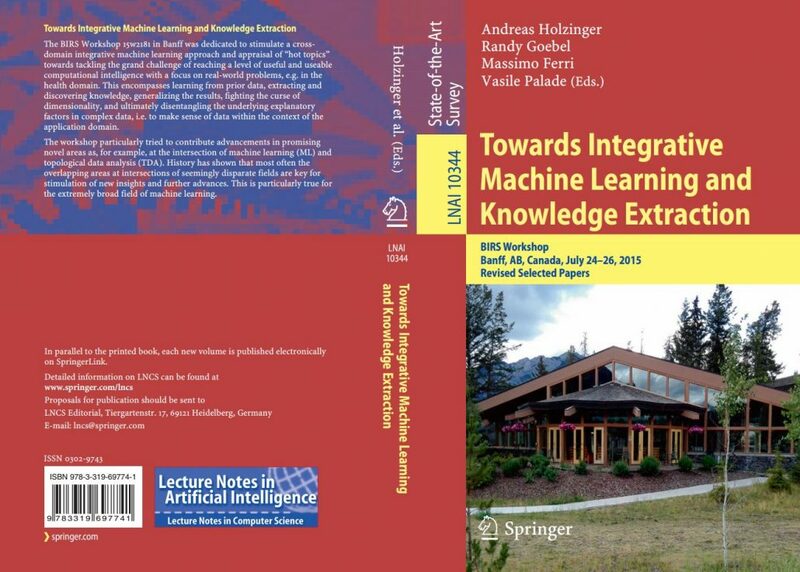 Towards Integrative Machine Learning and Knowledge Extraction: Springer Lecture Notes in Artificial Intelligence LNAI 10344. Cham: Springer International, pp. 1-12, doi:10.1007/978-3-319-69775-8_1. The BIRS Workshop 15w2181 in Banff was dedicated to stimulate a cross-domain integrative machine learning approach and appraisal of “hot topics” towards tackling the grand challenge of reaching a level of useful and useable computational intelligence. This encompasses learning from prior data, extracting and discovering knowledge, generalizing the results, fighting the curse of dimensionality, and ultimately disentangling the underlying explanatory factors in complex data, i.e. to make sense of data within the context of an application domain. The workshop particularly tried to contribute advancements in promising novel areas as, for example, at the intersection of machine learning (ML) and topological data analyis (TDA). Most often overlapping areas at intersections are key for stimulation of new insights and further advances. This is particularly true for the extremely broad field of machine learning, and successful machine learning needs a concerted effort, fostering integrative research between experts ranging from diverse disciplines – from data science to data visualization. 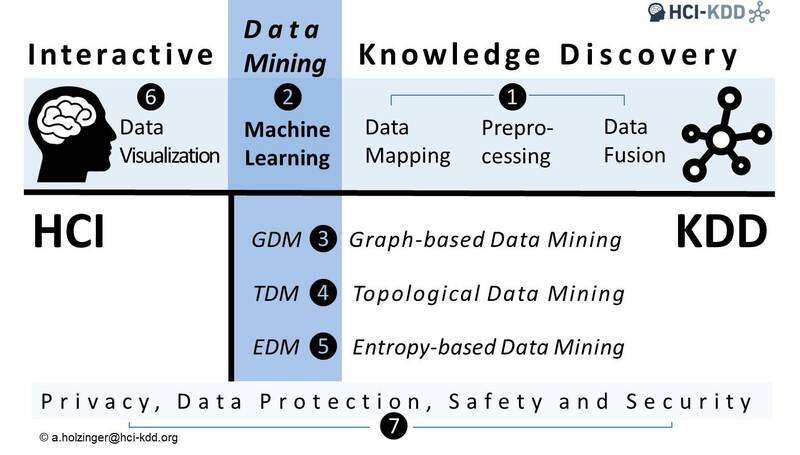 Tackling complex research undertakings needs both disciplinary excellence and cross-disciplinary networking without boundaries, and a cross-domain integration of experts, following the HCI-KDD approach in combining the best of two worlds (see image below). There are many challenges and open problems from various domains of our daily life (autonomous driving, smart factories, recommender systems, natural language understanding etc.). A good example for a complex application domain is health, and modern health sciences are turning into a data intensive science. However, sometimes the problem is not big data but complex data: heterogeneous, high-dimensional, probabilistic, incomplete, uncertain and noisy data. The effective and efficient use of ML-algorithms for solving complex problems in health informatcis are a commandment of our time and may support evidence-based decision-making and help eventually to realize the grand goals of personalized medicine: in modelling the complexity of patients to tailor medical decisions, health practices and therapies to the individual patient. This Volume of LNAI fosters cross-combination of the 7 areas – see image above – with the goal of realizing integrated machine learning solutions at the clinical and scientific workplace of biomedcine and health. This needs a concerted effort in bringing together experts with diverse backgrounds, complementary competencies, but common interests and a shared central vision: to extract and discover knowledge from data. Quality needs time – and we want to ensure the highest possible quality, to provide a clear benefit to our potential readers – so there is no fixed deadline, however, the Volume is now in production and expected to appear in summer 2017. There is no definite page limit – but the ususal chapters are between 10 and 20 pages. However, in any case, please produce even pages to ensure smooth page breaks, e.g. … 8, 10, 12, 14, 16, 18, 20, 22, … pages.